Ask fellow campers about "Totonaka RV Park" and nearby attractions. 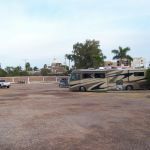 This is the only rv park we have stayed at in Mexico so far. It is located about5-6 hours south of the Nogales Az. border. You travel on good highways to the park which seem very safe at least during the day. The park probably has the nicest and most helpful manager of any park I have ever been too, on either side of the border!! It has wide spaces that are grass and dirt, 30 amp electrical, with non-potable water, and sewer at each site. Good english cable TV and good wifi at each site. The park feels very safe with a night security guard and locked gate. Overall the town of San Carlos I believe is very safe for tourists. The manager can make arrangements to have a 5 gal container of purified drinking water delivered to your site whenever you need it for about $1.25. Would definitely return next time in Mexico. Lots of Rv'ers use this as a stop before making the trip down to Mazatalan; I was told it takes about 12 hours to get their from San Carlos. We camped at Totonaka RV Park in a Motorhome. San Carlos is a small tourist town, very nice marina with good restaurants around it-try Hammerheads for pub fare. There is a local supermarket in town as well as a very good smaller market with a butcher. Just across from the RV park is the sea of cortez, and beautiful beaches not far away. About 15 miles away is the town of Guaymus with a walmart, propane, and larger supermarkets and pharmacies. We had none of the problems mention by the previous review. Pool was great, dogs enjoyed the park, no water pressure issues, sewer was fine, though WiFi a little weak at times. Owner and manager very friendly and helpful. Perhaps after most "snowbirds" have left, services are better. Park was about 1/2 full, and the time and weather ideal. Noise from the nightclub across the street was Mexican music...get used to it on a Friday night! We camped at Totonaka RV Park in a Fifth Wheel. We traveled to San Carlos for a one month stay. Upon arrival we were charged $30 more than we had agreed upon months earlier when we paid our deposit for our reservation. Our initial spot had no power and the sewer hookup was under the motorhome, plus we were out in the roadway. We then moved to another spot. Mexico standards and USA standards are very different. Cable meant 2 very fuzzy channels. WiFi works if you are sitting at the office. 30 amp power, some days you have it, some you don't. Find the breaker box because you will need to reset it hourly. Some days you will have water, some days you may not. Little water pressure. We had to run our pump all month long. The grounds are kept clean; however, my dog couldn't walk anywhere within the park without getting goat heads (a stickler weed) in her feet. On the weekends the night club across the street is very loud and stay open until 4 a.m. The pickleball court is great but there is rarely a slot to play because the owner allows players outside the park to take most of the time slots. We did not use the pool or hot tub. The laundry facilities - washers and dryers are very old. Some work, some take your money and don't work. My clothes didn't get clean and the dryers get so hot that one sports fabric shirt melted! I bought these issues to the owner and he is very condescending unless you have your husband with you. San Carlos is a beautiful area. That's what made our trip great, not this RV park. We camped at Totonaka RV Park in a Motorhome. Enjoyed the stay. Crowded park. Popular for snow birds. Easy in and out. Nice and convenient and good location! We camped at Totonaka RV Park in a Motorhome. We had a fabulous time in San Carlos and loved Totonaka. We booked for one month and ended up staying two! The owner and manager were awesome. If you needed anything from service on your RV or the best restaurant in town they would organize it for you. Staff was great as well, maintaining the casitas and apartments that are on site for rentals to manicuring the gardens and trees. Love this place and can't wait to get back this winter! We camped at Totonaka RV Park in a Motorhome. Beaches are beautiful and there is live music every day and or night at one of the many bars and restaurants in this town. Great second hand store called Cast Away Kids that sells great clothing, house hold items, accessories and all proceeds go to the education of local children. Nacapule Canyon is an awesome place for hiking or riding. Can't say enough about San Carlos! We fell in love with the town and people. Nice park, well maintained and clean. Problem with cable (8 or 10 English channels) was fixed promptly. Management friendly and helpful. The park was about 3/4 full in Feb. 2015, but management told us it would get fuller as folks from farther south started moving through on their way north. Our first Mexico trip, we were completely pleased. We camped at Totonaka RV Park in a Motorhome. This is a very nice park just across the street from the ocean. It caters to American and Canadian snowbirds. Although they claim not to have pull throughs, they allow folks to use certain spaces as pull throughs and we were given one of those, which was actually two spaces being used as one. Hard to explain, but it worked. There are some very big rigs in here. The park is mostly paved with some nice shade trees and a pool. Wi-Fi works well and is secure. We couldn't get much on the TV, but that is probably OK since we don't speak Spanish. We have a whole RV surge protector and it did trip once so the electricity is a little "iffy". Of course, DO NOT drink the water and you will need to sanitize your pipes after leaving Mexico, but that is a given when RVing here. Sewer connection is behind the RV rather than next to it, so bring some extra sewer pipe and an extender. We camped at Totonaka RV Park in a Motorhome. Jose runs/owns this place and speaks excellent English, BA from UCLA! Probably the most popular RV park in San Carlos. Our 30 amp voltage was 133 V which worried me but seemed OK. The spaces are wide enough for MH and toad and all have a concrete patio slab. All require back in, no pull throughs although if you only need to stay for one night you can park on the center aisle/road. We camped at Totonaka RV Park in a Motorhome. Rates are: daily $24 US dollars weekly $154 US dollars monthly(33 nights)$520 US dollars We camped at Totonaka RV Park in a Motorhome. Very nice for a Mexican park. I saw only back-in sites, and we had to park on the "wrong" side of the sewer connection to get our big rig in. The water and electric hookups are on the "wrong" side of each site, which means you need long water lines and electric cables as well. Excellent free WiFi. Across the street from the beach. Clean laundromat with 13 washers and seven dryers. Each machine takes six US quarters. Our site and our neighbor's site had very high voltage (138-140 VAC) until the evening, when everybody was using power. We stayed only one night because we were on our way south, but we wouldn't mind spending a month there. We camped at Totonaka RV Park in a Motorhome. By Mexican standards, we rate this very highly. It varies from one end of the park to another. Near the road it is noisy, especially on weekends. Water pressure and electric stability vary with the site. Ours is excellent, and we are in a 40' MH using both air-conditioners. Our electric is 30 amp with a 40 amp breaker, but that also varies with the site. Some are 15 amp with weak breakers. The pool is clean, but not heated. There is an on-site laundromat, storage units, and a motel. The park is fenced and has a night watchman at the gate. The WiFi is free and can be reached from all parts of the park with an outside antennae. The park is across the street from the beach. We camped at Totonaka RV Park in a Motorhome. Nice and easy location, so we stayed a month. Never noticed noise for the nightclub; we have soundproofing though. Sites in various states of repair/disrepair; electrical components are cannibalized from site to site. Mostly 15 amp breakers, with 15 and 30 amp outlets. Voltage runs from 132 -137 volts, bring protection. Good WiFi. Some biting bugs, near the back (the quiet sites). Can be tricky for big rigs, but doable. Friendly and helpful staff; hand washed and waxed MH for $60USD. Good Mexican park. We camped at Totonaka RV Park in a Motorhome. Are you affiliated with Totonaka RV Park ?